Taylor Electric Inc. has been a family owned and operated business started by Robert (Bob) Taylor a former Billings educator who taught electrical fundamentals at the billings Career Center, then HVAC electrical controls at the Billings College of Technology, and finally, Instrumentation at the Conoco Phillips refinery. Robert’s education, diverse background and years of experience were shared and combined with his two sons Ed and Joe to build a team of professional highly trained and skilled electricians. Robert, Ed and Joe have made it there goal to provide expert electrical services, create a staff environment that’s like a family and ultimately take care of customers with unmatched care. The relationships they've built have helped them become industry leaders. The Taylor family puts their name on every project they tackle. Taylor Electric Inc. provides electrical contracting services for Commercial, Industrial, Residential, Cellular Communications and a variety challenging special projects, including high and low voltage systems. The company is based in Billings Montana and supplies electrical contracting all over the state. Our team can handle a large electrical contracting project that is indoors, outdoors, below ground and high above the ground, with our highly trained and experienced technician team and project managers who understand being on time and on budget. Our construction equipment fleet includes the machinery required to execute every below-ground or above ground installation, including our Line truck reaching up to 60 feet. 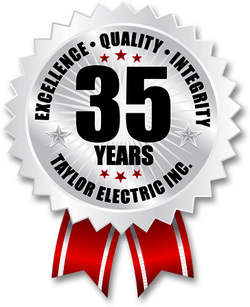 For over 35 years, Taylor Electric’s workflow process from start to finish has efficiency stamped at every construction milestone. Our goal has always been to keep enhancing the way we do business and construct our projects to build lasting relationships and products that are completed on time with structure that endures. We stay up-to-date, trained and certified on the changing electrical technologies and building codes for facility efficiency, safety and optimum operational success. Our headquarters are based in Billings and our service area extends to any part of the state of Montana. Taylor Electric is a premier choice for all electrical system construction anywhere in the state of Montana. For over 35 years, our legacy and philosophy for quality work, clean installations, dependable hardware infrastructures and the priority of safety has given us a reputation for excellence within the community and helped us build confident lifetime relationships with our customers.